Most stories told of EVE Online and its players are about deceit, subterfuge or betrayal; players who forsake everyday politeness to further their own in-game goals. But this is a story about the friendlier side of the EVE community, and a group called Broadcast 4 Reps, or B4R. It is not an in-game organization with strict factional ties, but an open-doors support group welcoming those from all walks of digital life. The organization’s charge is to get people the help they need when they need it, to provide a support net to players who need it, and most importantly to prevent those in desperate times from resorting to self-harm. Founded in 2014 by a player named Coffee Rocks, Broadcast 4 Reps offers a shoulder to cry on, a willing ear to talk to, or just a supportive atmosphere to surround yourself with. Its members exist in chat channels within EVE or on their Discord server, always willing to do what they can to help a fellow player in need. 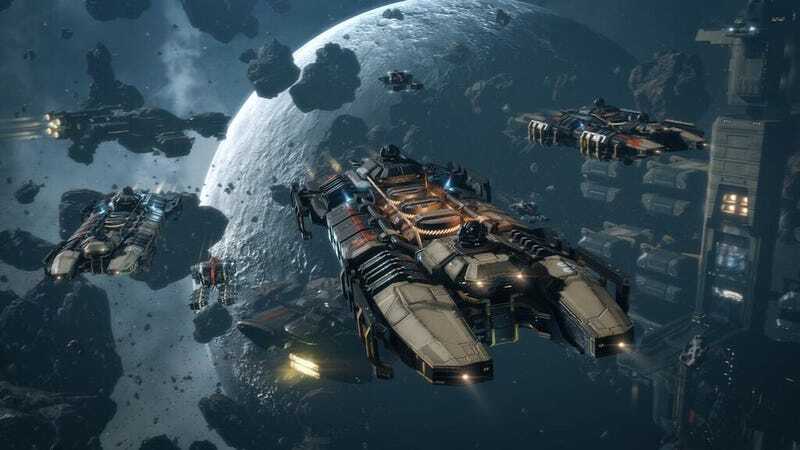 In 2015, EVE publisher CCP Games partnered with B4R to produce and distribute a video that described the group’s mission and told people where to find them. The group draws their name from well-known EVE jargon: To “broadcast for reps” in the game world is to send out a message that your ship is under attack and is in need of repair. When members of your fleet see your callout, they will come to your aid and prevent you from being destroyed. B4R lets players know that they can reach out for help not just when their ship needs repair, but when their real life does as well. Players who need someone to talk to are welcome to join their channels and reach out for assistance. Volunteers from all walks of life are constantly active in these areas, either waiting for “broadcasts” or just carrying on casual conversation. The volunteers listen to these concerns, offer their advice, and generally try and be as friendly and welcoming as possible. They do know their limits, constantly assuring people that professional help is the best option, and providing many references to get that help. Such simple human kindness may not sound like a lot to some people, but to those on their last desperate edge, it can make all the difference in the world. In some cases though, no amount of kind words or careful listening can make a difference, only decisive and immediate action. Such was the case in November of this year, when EVE players said they witnessed a fellow player begin threatening to take his own life. After apparently being removed from his in-game clan, he began to make threats and promise that he would be opening a Twitch stream where everyone could watch the event live. More and more players logged in to watch the player’s Twitch stream, and word began spreading quickly throughout EVE social circles. A Reddit user named cannonman58102, who was in the distressed player’s alliance, posted about the event, which he had watched in real time:the event a few days after marveling about watching the event in real-time: “He... linked his Twitch, and it immediately filled up with 350+ people in a matter of minutes,” he wrote. There were “two or three” trolls in the mix, but the rest were being supportive, he said. Multiple players were on voice communcations with the streamer, trying to talk him down, cannonman58102 said. On the stream, players saw the man seemingly ingesting a number of objects that appeared to be pills. By this time, word of the events had reached the in-game channels for the B4R organization. As people discussed what could be done to help the situation, one of the Interstellar Services Department, a volunteer organization that works closely with CCP to provide support and guidance to players, took notice, and immediately opened communications with CCP’s staff. The company sprung into action, immediately reaching out to contact Interpol and giving all of the information they had to make sure the man could get the help he needed. According to a report released by Polish police, Interpol forwarded the information to them. This, alongside several other reports from concerned individuals, led the police to act quickly enough to save the young man’s life. At some point before the police arrived, Twitch staff was also informed about the content of the stream, and it was quickly taken offline as per the company’s policies. It is possible that without the support network and awareness established by the B4R community, the man’s life could have taken a very different turn on that night. EVE is often heralded as a haven of sociopaths and miscreants, but this is a small bit of proof that not everyone fits that mold.